There are those who believe it was wrong to remove Saddam Hussein. Ismail Abdallah Rashid was buried two days ago in the northern Iraqi village of Halabja — his body finally succumbed to the effects of gas attacks carried out by Saddam Hussein’s forces on this day 20 years ago. Rashid becomes the latest in the still-growing toll of around 5,000 villagers from Halabja who have so far died from the chemical attacks carried out on March 16, 1988- France 24. This is dedicated to the people of Halabja who on March 16th, 1988 suffered the worst chemical attack committed by the Iraqi regime. On that day, 5,000 innocent civilians, 75% of them women and children, immediately perished. This was not the only chemical attack ordered by Saddam, it was just the worst- Halabja. Iraqi Prime Minister Nouri al-Maliki is participating in the ceremonies for the 20th anniversary of the Halabja massacre today. Al-Maliki will raise the curtain of a monument of martyr Omar Khawar. Khawar is a Kurdish man whose picture drawn as a man embracing his dead child killed by Halabj chemical gas attack in 1988, is known as the epitome of the massive human disaster- Aswat Aliraq. Saddam Hussein authorized the use of the “special weapons” against the Kurds. The Halabja attack, said to have involved mustard gas, nerve agent and possibly cyanide, killed an estimated 5,000 of the town’s inhabitants. 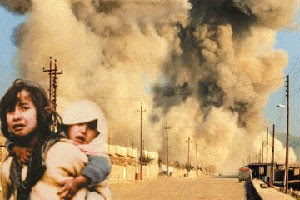 The attack on Halabja took place amidst the infamous al-Anfal campaign, in which Saddam brutally repressed yet another of the Kurdish revolts during the Iran-Iraq war. 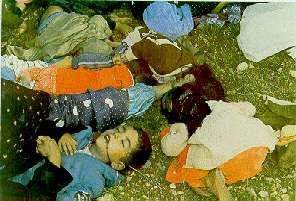 Saddam is also said to have used chemical weapons in attacking up to 24 villages in Kurdish areas in April 1987. 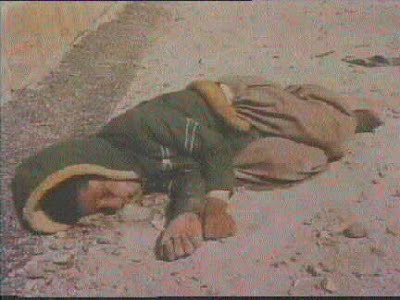 -To the people of Halabja- Our prayers. UPDATE: The Iraqi government remebered Halabja today. Carter Andress, CEO and principal owner of American-Iraqi Solutions Group, writes about this 20 year anniversary from Baghdad at National Review Online.